Paris Saint-Germain star Neymar stopped Liverpool’s Roberto Firmino in the middle of one of his post-match interviews after last night’s Champions League clash. 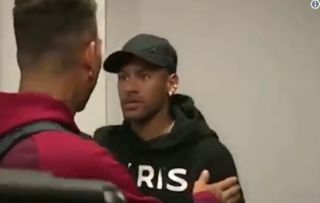 Neymar can be seen talking to Firmino in the video below and looking a little glum after PSG lost the game thanks to the Reds attacker’s stoppage time strike. Still, his fellow Brazilian congratulated him for getting the winner and said they’d talk again later. The pair clearly get on from international duty together with Brazil, and it’s nice to see there weren’t any grudges held in this classy moment after a great game at Anfield. It wasn’t the best evening for Neymar, who was largely invisible as PSG suffered again on the big stage in Europe, despite all their domestic dominance in recent years.